Fungal nail is more common among older adults. The causes are, amongst others, decreased blood circulation and a longer exposure to fungi. As the nails grow slower and thicker as you get older, they are more susceptible to fungal nail infection. 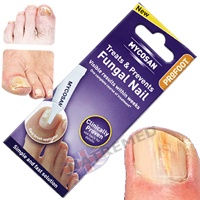 Fungal nails are equally as common among men as in women. Fungal nail infection is the most common foot problem. The increase of this problem may be due to wearing tight shoes and increasing use of public areas such as dressing rooms and saunas. Athlete’s foot – 1 in 4 people with athlete’s foot also develop a fungal nail. Bare feet in public spaces – for example swimming pools, public showers and the sauna. Problems with blood circulation – as well as tight fitting shoes and nail injury. Mycosan Nail – a simple, quick and effective way to get rid of a fungal nail. 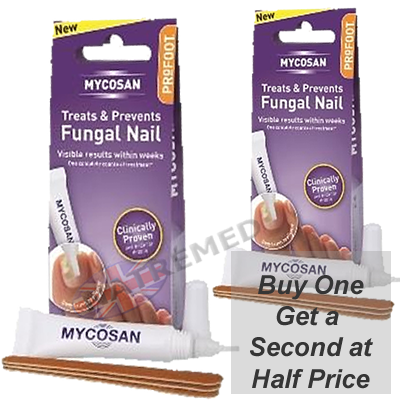 Mycosan protects healthy nails against fungus. All inclusive treatment pack; all the necessary products in one package. You do not need additional products like cotton wool, nail polish remover, nail files etc. Mycosan is developed in such a way that it distributes a specific dose of the active substances deep into the nail in the area where the fungus has to be treated effectively. 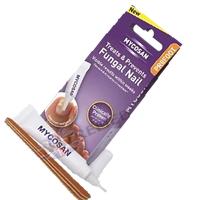 Mycosan® forms a layer over the nail which protects the nail against fungi. In this way, healthy nails are protected against fungi and the fungus can be treated. Maintain good foot hygiene, especially washing and drying between the toes. Hydrate the skin. Warm weather and open shoes can cause rapid loss of moisture from the skin and may result in cracking or the formation of fissures. It is helpful to replace the moisture content by using lotions or creams on a regular basis. Buy the correct size shoes. You may not wear the same size in shoes made by different manufacturers. Purchase new shoes late in the day, when feet tend to be at their largest. Always buy the shoes that feel the best. Don’t ignore foot pain. Symptoms that increase or do not resolve within a reasonable period of time need to be evaluated by your podiatrist. Cut toenails straight across. Never cut into the corner this could cause an ingrown toenail. Gently file away sharp corners or rough edges with a nail file. Avoid biting or clipping cuticles, which is likely to weaken and expose nails to micro-traumas. Change your shoes each day. Since the feet have sweat glands, your shoes will absorb moisture from your feet, so it is important to allow your shoes to dry out completely. Avoid shoes made from synthetic materials. Always wear sandals in swimming pools and changing rooms to help protect your feet from injury and fungi infection, which proliferate in humid environments. Put sun-block on your feet while wearing sandals during the day to avoid sunburn. Opt for wearing cotton socks to keep your feet fresh and dry. Change them regularly in case of high perspiration. Treat athlete’s foot (foot skin fungus) immediately, the fungus can spread to the toenails. With this type of fungus, it is also recommended to treat socks and shoes with an anti fungal product. There are different types of fungal nail. The most common type is one which starts at the edge of the nail and spreads towards the nail cuticle. This does not happen with other nail problems.